The on-going human-wildlife conflict in Amboseli moved a notch higher yesterday with a complete show of bravado never seen in the recent past. 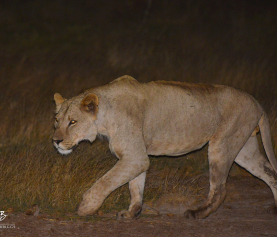 Monday in the middle of the night a lioness, Amyjane, had jumped into a boma adjacent to the park, killed a donkey and cow, and was speared in the front left leg. The morans responsible for the spearing wanted to follow her into the park, but were persuaded not to by elders and village leaders. The morans heeded their advice, but continued to monitor the movement of the lioness inside the park. The following morning we were called in to track and assess the situation of the lioness. She was deep inside a small thicket when we found her and it was clear that she was experiencing a lot of pain. She didn’t move when we drove close with the vehicle and she exhibited a lot of aggression which is unlike her normal behavior. Then as fate would have it, the veterinary officer that was supposed to treat her was summoned very early in the morning to attend to a rhino that had died due to a gun wound from poachers in the Chyulu Game Reserve. While awaiting the vet to arrive, we responded to another depredation report we received from Lion Guardian Jackson in a nearby zone. During that time, a herder brought livestock inside the park for water very close to where Amyjane was hidden. When she saw the herder, she growled and the livestock scampered for safety, thus prompting the herder to summon the morans from the nearby cultural boma. They responded immediately and tracked the lion within 10 minutes and speared her ten times till she succumbed to death. At this time we had just finished verifying Jackson’s report and were on our way back to check on Amyjane, with five Kenya Wildlife Service rangers we picked up on the way. As we were approaching the site where we last saw her (about 50 meters away) we found a lion paw freshly cut. We immediately started to fret, but we also thought that maybe it belonged to another lion that might have been killed earlier that morning. Worried, we rushed to the site where we had last seen Amyjane just an hour ago, but she was nowhere to be seen! We immediately reached for the receiver to track her collar, but unfortunately after five minutes of searching we came up empty handed. At this time we returned with the KWS rangers to where the paw was found and started tracking the perpetrators foot prints. Using my traditional tracking skills we followed their fresh tracks for about five minutes until we reached Amyjane. Her body was dismembered; specifically the torso was cut in half and placed 50 meters apart likely to conceal the killing. Her head and all of her paws were missing. This was proof that her killers were in a hurry to leave the site, accompanied by their intentions to sell the fresh trophies to the nearby tourists who visit the park. Interestingly, the tail which is the most important part of traditional lion killing celebrations was still intact: meaning that the killing was not traditionally motivated. It was a ghastly site to see, especially given the fact that we had just seen her alive a few hours ago. I was horrified and heart broken at the same time. After joining Amyjane’s torso to verify it was one lion that was killed we decided to follow the fresh tracks of the warriors, which led to the nearby cultural bomas. What was interesting is that the cultural boma, which is always a bee-hive of activities (especially during the high season), was so conspicuously silent that one could hear a pin drop! Amyjane whose pride has known misfortune over the last few years is the latest victim. Her sister mysteriously died two years ago and left her the duty of bringing up nine small cubs. She successfully brought six of those cubs to maturity, while one was killed by an elephant. Another was killed by a pair of resident male lions and the third was speared at the gate of the same cultural boma in which her mother’s killers live. Currently, she has three very small cubs whom she left with her companion, who also has three cubs of the same size. We hope that she will be able to bring up all six cubs, but it will be a very difficult feat. Amyjane’s companion will have a difficult task in trying to raise all of the cubs to maturity. The cubs pictured here are from a litter she had in 2010. 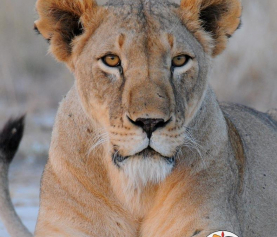 During the past week in Olgulului Group Ranch, lions have gone on a rampage and killed three cows, three donkeys and seriously injured six cows, all resulting in three lion hunts. Lion Guardians managed to stop all the three lion hunting parties in the respective zones. This is due to our diplomatic and non-accusatory approach. But, unfortunately Amyjane was hunted inside the park (outside of our jurisdiction) where existing tensions between the community and KWS has lead to a decrease in tolerance. Eric used his tracking skills to locate Amyjane’s body and track her killers to the nearby boma. Currently, the situation in Amboseli is tense and the relationship between the community and KWS is at its lowest ebb and we fear for the future of the local wildlife. The previous conflict resolution meeting on Aug 6th, failed to arrive at an amicable consensus between KWS and the Maasai community. The Maasai community gave KWS 21 days to respond to their petition requesting a fair distribution of the park revenue. If the morans are bold enough to hunt in the park in broad daylight and kill a collared lioness now, I shiver to think of what will happen if the trust between the community and KWS is severed over revenue-sharing. The parks wildlife will not survive without communal support and Amboseli National Park will be no more than a glorified zoo!! agreement in order to stop more senseless killings like that of Amyjane. What a tragic story. So sorry and will continue to send good thoughts and Reiki healing to your endeavors. Keep up the good work. After just being on a safari in the area I am heartbroken to hear relationships are deteriorating with the Maasai. I hope everyone can work together as it is in all parties best interest! 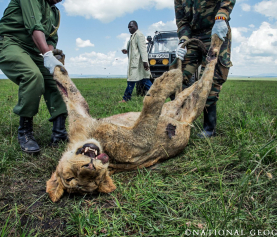 Thank you for the wonderful work the Lion Guardians are doing. Our trip to Amboseli was amazing, and unforgettable. I hope others have the same opportunity. How I’m sad to read this! I remember when I went either in Amboseli or Tsavo, several times: I will never forget my “meeting” with the lions keeping an eye on me … through the car: I felt so tiny in front of such a look on me! I wish you to continue what you do with KWS and Maasai, peacefully. In your diplomatic encounters with the local Maasais that KWS does not have the power to decide on revenue sharing?have you talked to them about the revenue allocation commision’s mandate as well as the powers of the central government. in deciding how revenue is shared among all citizens .what have they to say about CDF usage or that is out of questsion? I have realised that the people and NGOs that are working with. the local maasais. have not educated them as required on the duties and responsbilities of citizens,Does it mean that every part of Kenya should start sharing their revenue as small autonomous countries of tribes? It’s not that long ago that I thought of the Masaai, for the most part, as gentle loving people and had so much respect for them. I no longer feel that way. In fact, I now see them as a bunch of immoral murderers. Killing innocent animals to send a message. No different than the gangs and mafia that kill to send a message. This is so disappointing and my dreams of meeting the Masaai are no longer a part of my ‘bucket list’. Shame on them. It saddens me to read this. I knew this lioness, along with the other lions inside the park, personally. Many years ago, I was fortunate enough to spent a wonderful week with the Maasai, both in and out of Amboseli. While it is sad that a lioness was prematurely killed, lets get some perspective. The Maasai live there permanently. They grow up facing the dangers of knowing Lions live and hunt in the area. Once a Lion enters a bomba (Maasai coral/home), the gloves are off. Its time to defend their wives, children and livestock. With deadly force if needed. If the animal is merely wounded, then the animal is more of a threat to the locals than ever and should be humanely dispatched as soon as possible. Comparing the Maasai to ‘gangs and Mafia’ is ignorant. Good work, keep it up. Lets keep the journalism as neutral as possible. This has weighed heavily on my mind. I think the only way to stop this is to reimburse the people for the livestock a lion kills, provided they don’t kill the lion. How many livestock are killed each year and what is the cost? I am willing to put money towards replacing livestock that has been killed as long as the lion is not killed. How many are willing to stand with me? I am also going to check with Panthera and other organizations like Born Free to see if there are funds available for this. The Lion Guardians monitor the situation as it is, and can dispense the funds. Agian this has to be an agreement with the people that they will not kill the lions.